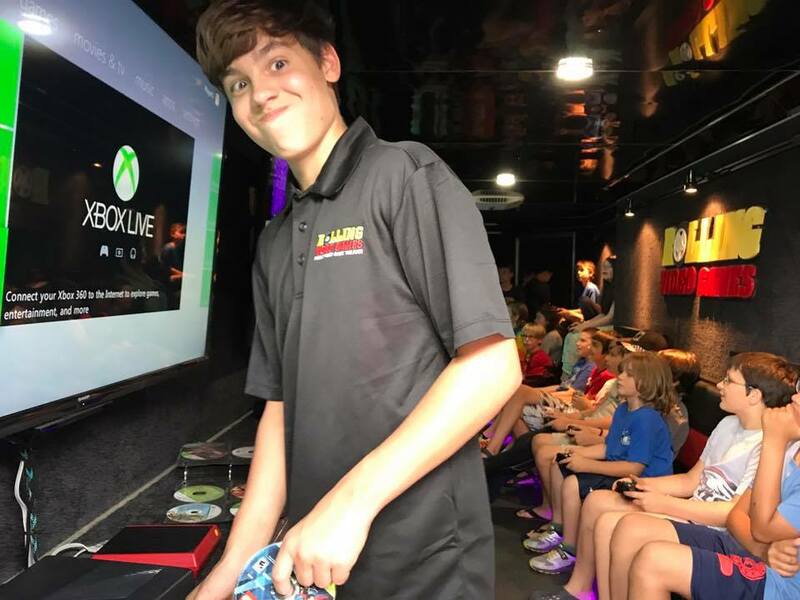 My sixteen-year-old came with me to a Rolling Video Games event booked for Saturday at 2:00pm at a local school fundraiser. We stopped the truck in front of the main entrance and I went inside to greet the principal as he prepared the trailer for the big load of kids soon to come inside our mobile video game theater. I didn't have to check on him. He is an expert. He's been doing it since he was seven. You might recognize him in some of the video commercials for Rolling Video Games: the boy on the front steps, the boy with the medallion, the boy laughing and gaming. He and I had no idea the impact Rolling Video Games would have on him as the years went by operating this local business in front of homes for birthdays and events. Unlike a restaurant or a construction business, Rolling Video Games didn't present dangers or hassles of having kids around. He came with me to many of the parties as "my little game coach". I was proud. "Dad, these kids are older. I can't tell them what to do! ", he said as he squirmed in the front seat of the truck on the way to our first party. "Yes, you can. You are the game coach. They are the customers. You help them pick a game. You show them how to play the game. You know how to do that! Be a friend." "So, that's it! Your job is to make sure everyone is having a great time--"
"But they aren't going to listen to me! ", he protested. When we arrived at the house, he groaned as he got out of the truck and put on the cap with the Rolling Video Games logo. 14 kids lined the front yard, jumping up and down as we walked back to the mobile video game trailer and opened the doors to start the event. We touched the button and the generator started up, the lights, TVs, game consoles are kicked on and the kids bounced in the door one by one and sat down. My son spoke softly to the group, just before the gaming started. He was nervous. "Raise your hand if you have a question! ... I'm here to help! ", his voice squeaked just loud enough for everyone to hear. They nodded. The party had begun and the kids played different video games and occasionally raised their hand. I beamed with pride as I watched my seven-year-old gain confidence as he sat next to the older kids, explaining a game or helping load the next game they wanted. Each time he helped someone, his confidence soared higher and he had a smile on his face I had never seen before. He became quicker to respond to a question and I sat at the end of the trailer, pretending to be busy on my phone, but I had one eye on my son, watching him grow up. We all see milestones in our kids' lives. This was a big one. My son was quiet. He wasn't the loudest kid in any room. He was good in school and he loved video games but I wanted to open his world to new things and to experiences to give him a leg up. I knew that business owners had an advantage of owning a business that involved their family in some way: sweeping the floor of the small grocery store or working the counter at an ice cream shop. I always thought that it was smart to involve them in a world to teach them a work ethic. But I realized it showed so much more than that. ​As my son grew older, he asked questions about business. Not only did he ask about the price of the parties, he compared the prices to the market value of other party choices in the area. He did the math and saw what we were earning and how we could benefit the business by appearing at charities and offer incentives. He was understanding customer service and began speaking to the clients that booked the parties and shook their hands as we left. He started to learn business. What made this business thrive? He analyzed the layers and started to realize some things quicker than I did. "Dad, if you linked these games across all the TVs, the kids would love it", he explained. "Before we leave the party, we should count-down from 15 minutes. It will give the kids a chance to close out the games and power down so everything doesn't end abruptly." It wasn't long before he grasped it all. In my mind, I thought it was great that he'd learn what his dad did. But, as the years went by, he had it all figured out and now at sixteen, he hopes to go into business with his eyes on certain colleges. He doesn't go with me to as many parties today because he has school events and sports on weekends. But, I know if I needed my little game coach, that he'll come with dad to help. © 2009-2019 Rolling Video Games, LLC All Rights Reserved All characters are licensed and trademarked by their respective owners.